The above data are from paid search trends compiled by Kantar media on the ranking of the top 20 costumes by text ad and product listing ad spend on Halloween costume keywords on U.S. Google desktop search. 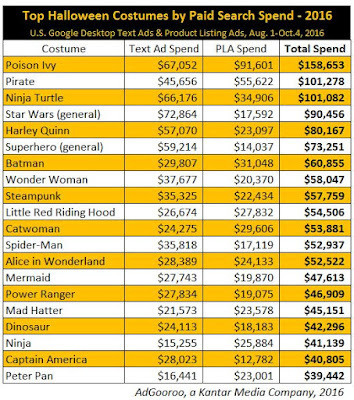 With nearly $159,000 in paid search spent on Poison Ivy costume keywords over the past 2 months, the character has generated around $58,000 more in paid search ad spend than the next two most popular costumes, Pirate and Ninja Turtle, searches which each generated $101,000, respectively, during the period.After some (brief) online research, we believe the apparent popularity of Poison Ivy costumes this year may be due to two factors—recent pop culture relevancy and a dual appeal to children and adults. First, Poison Ivy is featured in the “DC Super Hero Girls” comic, video and merchandise line, which debuted in October 2015 and is aimed at young girls. 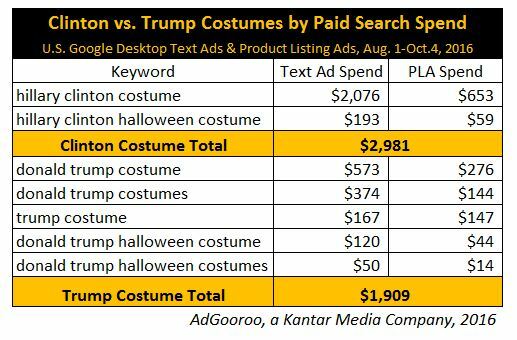 Second, we suspect the character has gotten swept up in the same zeitgeist that propelled another somewhat obscure Batman villains, Harley Quinn, to the top of Google’s Halloween costume searches in 2015. Not to be left behind were this years US Presidential candidates Hillary Clinton Halloween costume keywords and Donald Trump costume keywords .Hillary Clinton Halloween Costume keywords generated a total of $2,981 in paid search ad spend from August 1 through October 4 compared to $1,909 generated by ads served on five similar Donald Trump costume keywords during the period. That’s a difference of 56 percentage points.